The Prince of Wales and The Duchess of Cornwall visited the United Arab Emirates today, as part of their seven-day Royal tour of Oman, the United Arab Emirates and Bahrain. Today’s engagements included a visit to the scenic Bu Tinah Island to hear about the UAE’s conservation work and a tour of the Abu Dhabi Falcon Hospital. The Prince began the day visiting Bu Tinah Island, which is located off the coast of Abu Dhabi. The Marawah Marine Protected area is the largest of its kind in the Arabian Gulf. The Prince of Wales took a boat tour on the turquoise waters of Bu Tinah Island today, as the second day of the #RoyalVisitUAE began. The coastal waters of Bu Tinah Island are home to important coastal ecosystems and rare and globally endangered marine life, including hawksbill turtles and dugongs, a globally threatened marine mammal. HRH heard about the work of the of Environment Agency Abu Dhabi during his visit, and even managed to catch a glimpse of a number of sea turtles, flying fish and rare birdlife. Bu Tinah Island is home to important marine and coastal ecosystems including sea grass breeds and coral reefs, and His Royal Highness was able to see the island’s sea turtles, flying fish and rare birdlife during a buggy tour of the island and a boat tour of the surrounding waters. It was then on to Masdar City, a regional centre for innovation and research dedicated to clean and alternative energy. Masdar City combines state-of-the-art technologies with the planning principals of traditional Arab settlements, to create a desert community that aims to be carbon neutral and zero waste. Here The Prince took a ride in a driverless electric car to the entrance of The Masdar Institute for Science and Technology, saw a model of the city and signed the electronic visitors book. His Royal Highness also joined a Youth Circle with Emiratis aged 18-30 to discuss the thoughts of the young people present about the future and the environmental legacy they will inherit. The Prince finished his afternoon at a Finance Leaders meeting to discuss sustainability challenges. In November 2015, The Prince's Accounting for Sustainability, in partnership with the Abu Dhabi Sustainability Group and the Pearl Initiative, launched the "Circle of Practice" in Abu Dhabi, to explore how Chief Financial Officers in the region might consider the integration of environmental and social issues into business processes and strategy. 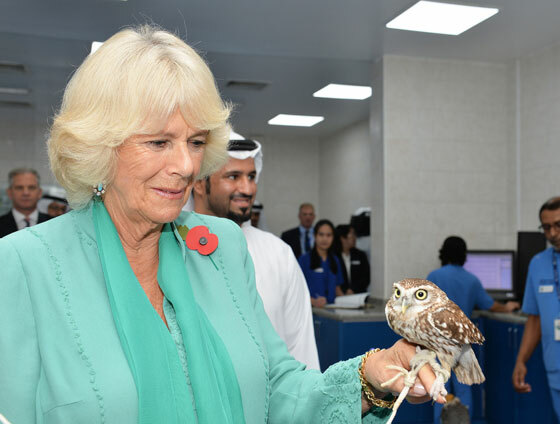 The Duchess of Cornwall meanwhile visited the Abu Dhabi Falcon Hospital, the world’s largest avian hospital and the leading centre for falcon medicine. Her Royal Highness was given a brief introductory talk on the history of falconry and its importance in Arab culture before meeting a group of children who were learning about the different aspects of Bedouin culture. The Duchess held a small owl called Baby, aged five, which lives at the hospital and goes hunting each night. Dr Margit Gabriele Mueller, Head Vet and Executive Director of the hospital, said: "It is a very important part of daily life of the Emirati. "In the modern world, it is one of the few opportunities for Emiratis to go back to their roots and preserve their traditions. "To have The Duchess here is overwhelming for us. It is such a great honour to have her and it shows how important falcons are here and it will help cultural understanding." Afterwards, Her Royal Highness joined a tea on Women’s Empowerment alongside Noura Al Kaabi, the UAE’s Minister of State for Federal National Council Affairs. Guests included Major Fighter Pilot Mariam al-Mansouri, the first female fighter pilot in the UAE. 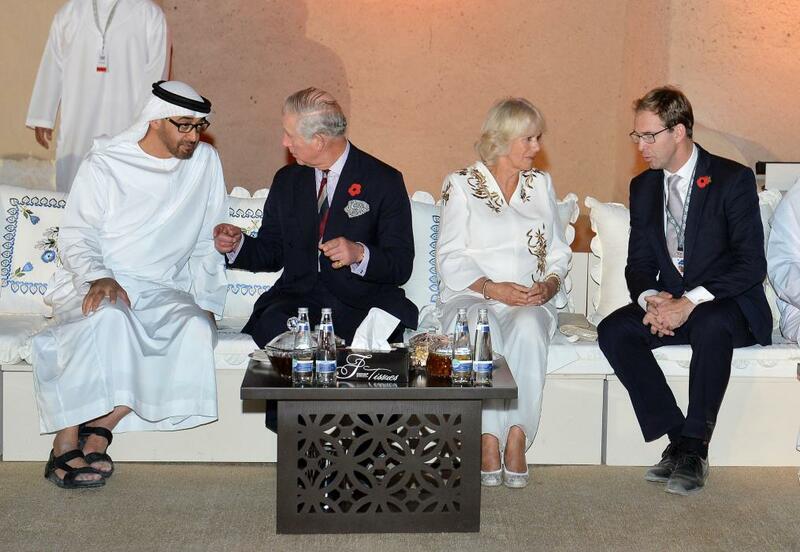 In the evening, Their Royal Highnesses launched the UK-UAE Year of Culture at the historic Al Jahili Fort in Al Ain, where they watched a traditional folk dance - or Ayala - and met Emirati and UK delegates. They attended a traditional majilis, or gathering, before viewing a display of calligraphy and taking their seats in the concert area. Students from the Centre for Musical Arts and a duo from the BBC Symphony Orchestra performed two pieces on the stage. The Prince then presented facsimiles of a Koran manuscript held by the University of Birmingham, one of the oldest in the world, to Sheikh Mohammed bin Zayed Al Nahyan, the Crown Prince of Abu Dhabi. Gavin Anderson, Director for the UAE at the British Council, said: "The UK and the UAE have a long history of collaboration and the preservation and display of this historic manuscript is the perfect example of how this collaboration continues to this day." The Prince of Wales and The Duchess of Cornwall are conducting an official visit to the Sultanate of Oman, the United Arab Emirates and the Kingdom of Bahrain from 5th-11th November 2016.